If you ask someone if they have heard of the Cirque du Soleil I'm sure the answer will be, 'yes'. Since 1984 they have been entertaining audiences with their thrilling mix of dance, gymnastics and theatrical performances. They are now back on the road with their remarkable show Varakai and we were there for the opening night on their Sheffield Arena stop. Varekai describes itself as 'Tales from the Forest' and is certainly more than just dance and acrobatics – it is a complete story on its own. The scene is set before the show starts with sound of the wind howling around the arena and through the glowing trees. Just before the show starts the spotlight falls on an usher and usherette walking through the audience. They 'help' people to their seats, dusting their clothes and polishing their heads. Popcorn goes flying when they are scared by the characters who have appeared on strange. This couple appear again in sketches throughout the show. It is a curious mix of two different worlds but their presence was enjoyed by all. The main show begins with mythical creatures crawling across the stage. Soon a carnival starts but the dancing and celebrations are cut short when a young man falls from the sky. As he lays on the ground he is stripped of white feather wings. From then on we are amazed by all the tricks and skills of all the weird and wonderful beasts that live within the forest. One thing you really appreciate when you see a live performance of Cirque du Soleil is that all you are seeing is happening there and now. There are no cuts or restarts. Everything they do has to be precise and spot on first time and every time. 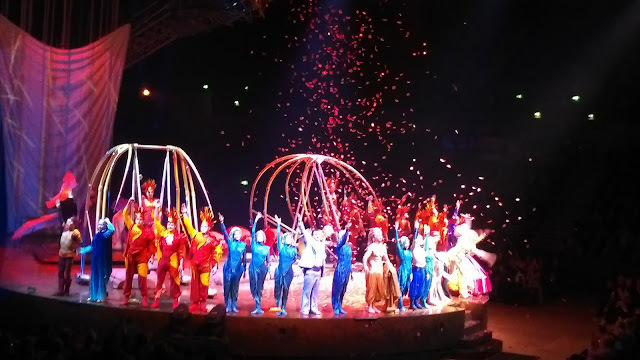 This is particularly evident in the finale with the swings and flying acrobatics. A breathtaking spectacle which had my heart in my mouth. Many a time we were sat open mouthed shaking our heads in disbelief at the stunts. Most of the show isn't particularly fast paced but based on beauty and grace yet still being powerful and supremely athletic. It takes in musical and dance styles from different cultures. The baton twirling and juggling has a backdrop of Irish folk music. There's also a sequence with a mixture of Cossack and Greek dancing styles. The name Varekai itself comes from Romany gipsy and means 'wherever'. If you're a fan of beautiful dancing, amazing stunts and stunning costumes and make up this is for you. Cirque du Soleil will be touring with their show Varekai this year throughout the UK and across Europe. You can book tickets for Varekai here. We were given review tickets for the show. All thoughts, words and photographs are my own.